Fr John Reid OSA arrived as the sixth Parish Priest in October 1995, and established St Joseph's as a true Augustinian Parish. He was joined by Fr Matt Curran OSA and Fr Sean Ahern OSA. When the Friars moved from Currie, they retained three chaplaincies; prison, university and St Augustine's, and to meet those requirements properly, four friars were appointed to serve at St Joseph's from October 1995. However, only three arrived! 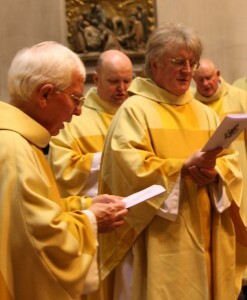 Fr John took on the University, two schools and the Parish, while Fr Ian Wilson OSA travelled from Dundee one day a week to serve the Prison, with Fr John and Fr Sean saying 10am Sunday mass at the prison and then galloping back for 11am Sunday mass in the Parish. While both Fr Sean and Fr Matt were happy in the parish - Fr Matt gentle, prayerful and dedicated to the housebound, Fr Sean wonderfully eccentric, getting the 8.30am mass to sing their heads off, St Joseph's Priory, with the regular vandalism was no place for older, retired men. Both left for Dublin eventually, with Fr Sean passing away soon after. Fr Billy Baldwin OSA arrived in May 1996 and took on the Prison and St Joseph's School. He was much loved by the children (and many of their mothers!) But after a heart attack (not due to too much hugging...) he was moved down to Clare in June 1997 for further treatment. Fr Ben Beary OSA joined the community in May 1997 and took on the prison, as well as an active role in the Parish. He was a much loved member of the community, known for his ability to call a spade a spade in no uncertain terms. Fr Ben was described as humble, ordinary man, he had a profound effect on everyone he came into contact with; from those he ministered to in Saughton Prison, to the patients he visited in the Western General Hospital. He introduced a dog, Leo, to the Priory which became as much loved as it's owner. This image of Fr Ben and Leo became one of the most enduring images of the Augustinian community at St Joseph's. Fr Ben sadly passed away while on holiday celebrating his 65th birthday in Montpellier in September 2003, much to the dismay of the parish. A book of remembrance remains at the back of the church dedicated to Fr Ben. Fr Laurence Brassill OSA returned from the Augustinian missions in Ecuador and came to stay in Broomhouse from the summer of 1999. He brought a new energy to the Parish, establishing a charismatic healing group. He became well known on a Sunday morning for his energetic sermons, given from the centre of the sanctuary rather than from the lectern. A microphone stand was installed at the foot of the pews especially for use by Fr Laurence. Whilst his time in the parish was limited due to travelling commitments, he became a well known and much loved member of the community.